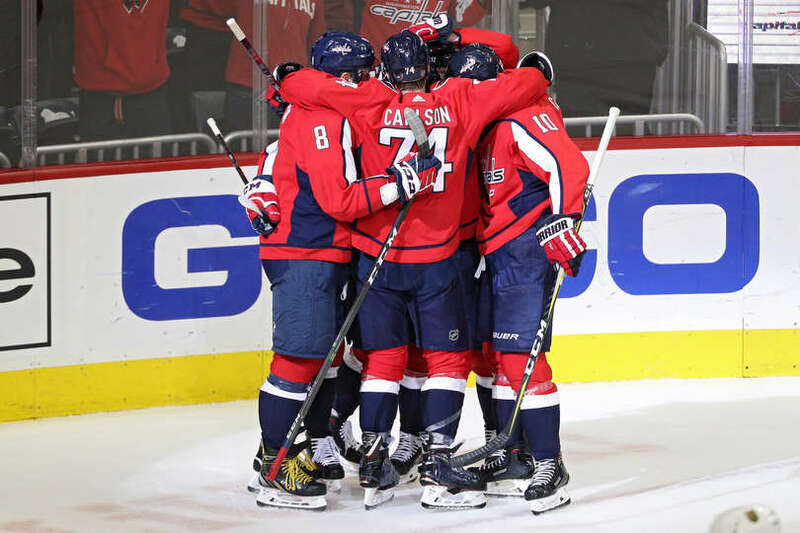 The Washington Capitals beat the Vegas Golden Knights 5-2 Wednesday night at Capital One Arena, improving their record to 2-0-1. The Capitals depart for New Jersey following the game, and will face the Devils tomorrow night at the Prudential Center in Newark. The Capitals struck first with a power play goal from Evgeny Kuznetsov in the waning seconds of the opening frame and stretched their lead with an Ovechkin goal midway through the middle frame to make it 2-0. The Knights would get on the board 31 seconds later to make it 2-1 at the second intermission. The Caps would add to their lead early in the third period only to see the Knights quickly answer once again, making it 3-2. Alex Ovechkin would score his second of the game midway through the final frame to make it 4-2. T.J. Oshie would add an empty net goal to make it 5-2, and that would be the final. Nathan Walker and Madison Bowey were the healthy scratches. A fairly crisp start for both sides, with both the Caps and Knights generating several decent scoring chances in the first ten minutes of play. The Knights would be the benefactors of the game’s first power play, but the Capitals penalty kill was stifling, and generated the only shot during the Knights’ two man advantage. The Capitals would go on their first power play immediately following expiration of the Knights’ man advantage, but would also come up empty. The Capitals would finally break the scoring drought with a power play goal by Evgeny Kuznetsov at 19:25 of the opening frame. Nicklas Backstrom fed Kuznetsov with a beautiful pass for the deflection and score. John Carlson was credited with the additional assist. The period would end with the Capitals leading 1-0. The Capitals outshot the Knights 9-4 for the first period. The Capitals won the battle at the faceoff dot 61-39%. The Capitals would stretch their lead to 2-0 with a goal from Alex Ovechkin at 10:18 of the middle frame. The goal was setup by a beautiful feed from Evgeny Kuznetsov. Brett Connolly was awarded the other assist. However the Knights would get one right back with a wrap-around goal from Cody Eakin just 31 seconds later. The period would conclude with the Capitals holding on to the 2-1 lead. Shots on goal were 16-8 in favor of the Knights. They led in SOG 20-17 after 40 minutes of play. The Knights dominated the battle at the dot in the middle frame, and led 53-47% after 40 minutes of play. The Capitals would stretch their lead to 3-1 with another power play goal early in the third period. Nicklas Backstrom would cleanup the loose change on the door step at 5:08 of the final frame. Evgeny Kuznetsov and John Carlson were credited with the helpers. But the Knights would respond two minutes later. Riley Smith would score from close range at 7:08, making it 3-2. The Capitals would regain the two-goal margin with a goal from Alex Ovechkin, his second of the game and fourth of the season at 10:33 of the final frame. Evgeny Kuznetsov and Brett Connolly registered the helpers. T.J. Oshie would add an empty net goal to make it 5-2, and that would be the final. The Capitals have now scored 18 goals in the first three games. Evgeny Kuznetsov had 1 goal and 3 assists for the game. Ovechkin’s first goal was career goal #610, tying him with Bobby Hull for 17th overall all-time. He has two in the game and now has 4 goals in three games this season. Nicklas Backstrom had a goal and an assist. With an assist on T.J. Oshie’s goal, Matt Niskanen recorded his 300th career point. This was the Capitals first regular season win over the Vegas Golden Knights and the fifth straight win, going back to the Stanley Cup final. This entry was posted in News and tagged Alex Ovechkin, Evgeny Kuznetsov, Jon Sorensen, Nicklas Backstrom, Vegas Golden Knights. Bookmark the permalink.